Although there's a certain artificiality to it, looking back over a year does provide a certain kind of perspective. I recall 2006 as the year of new beers. This year, by contrast, saw breweries release very few new beers beyond seasonals. So trends can be charted. One may also stop to ponder the changes a year witnesses--the new arrivals as well as the departures. Artificial it may be, but year-end reviews aren't mere fluff. So, with no further ado, here's one blogger's thoughts on 2007. 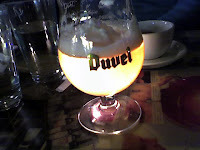 The use of Belgian yeasts in general and the emergence of Duvel-type strong golden ales in particular represented a minor yet welcome trend in brewing. Going back to '06, when Full Sail debuted Vesuvius, and then this year with Deschutes' 20th Anniversary ale, Max's Farmer's Daughter, and Double Mountain's Devil's Kitchen, we have four examples (which you might argue does not represent a trend, but then again, you're not writing this blog). Double Mountain led the way in Belgian yeast experimentation, but the trend is growing. Max Teiger also experiments with it, as does, increasingly, Ron Gansberg at Raccoon Lodge. What I find most interesting is that the yeasts aren't just being used to create traditional Belgians, but often as a way of adding a little extra zing to a style that would otherwise be considered pedestrian. As we brace for the effect the hop and barley shortages are bound to wreak on good beer in 2008, it's worth noting that once again, craft beer had a very good year in '07. Sales were up again by double digits for craft beer, and this contrasted sharply with the flat sales industrial brewers experienced yet again. The result, predictably, was faux craft--beers either brewed in macrobreweries that disguise their origin, or small breweries snapped up and operated by the bigs. In Oregon, we saw the release of Henry Weinhard's Organic Amber as a local example. Fresh hop ales. By the boatload. Also, the increasing use of organic ingredients. What began as niche products may be the norm in ten years. 2007 saw both of these trends turn almost-mainstream. So maybe there weren't a lot of new beers released by old breweries. There were, fortunately, a great deal released by new breweries. And, in what amounts to a fairly major trend, four of the new openings were second places by already-established brewers. Max's Fanno Creek - Max Tieger's second brewpub, this labor of love opened in Tigard in May. Heater | Allen - McMinnville's second brewery, and Oregon's only all-lager brewery. Super tiny now, but planning to expand. HUB (sorta) - Hopworks Urban Brewery, Christian Ettinger's second brewpub, didn't open in 2007--it's slated for early '08--but it did release a lot of beer. Double Mountain - Charlie Devereux and Matt Swihart took their show on the road--or down the road, about four blocks from Full Sail to open this wonderful new brewpub in downtown Hood River. It was the best debut by a brewery since Roots. Southern Oregon Brewing Company - Medford's first brewery, a fairly substantial 20-barrel operation, released its first beers in November. Beer Valley - Ontario, Oregon's first brewery, which has an impressive slate of burly, interesting ales, including an imperial stout and barleywine. Wildfire - a project of a local Bend pub--JC's Bar and Grill. Bailey's Taproom - a sleek, open new taproom in downtown Portland just across the street from the Tugboat, and it may well boast the best selection in the city. Green Dragon - while it may get bumped up to brewpub status eventually, the Green Dragon has been, for the past few months, just one of the nicest new pubs in town--featuring wonderful beers alongside excellent food. Belgian Embassy - in the old house formerly occupied by Lovely Hula Hands in North Portland (just up the hill from the Gasthaus) is a restaurant featuring Belgian cuisine and an impressive list of Belgian beer--in the bottle and on tap. Belmont Station Biercafe - one of the coziest corner spots in Southeast Portland. A smallish selection of beers on tap, but easily the largest in the bottle (800+). Michael Jackson (1942 - 2007) - Even after four months, I am still left with the feeling of absence after the death of the wonderful British beer writer Michael Jackson. Even the act of looking back through this year's news, one sees the churn and change. What a shame we have lost the world's greatest interpreter of beer and brewing. Feels like we're flying without a net. We will miss your wit and your words, Michael. How could I conclude a year-end wrap-up without mentioning the Honest Beer Project? I couldn't, and haven't, but there's no reason to belabor the point. Enough. We already know that 2008 will be interesting: brewers are scrambling to brew without certain hop varieties; they're trying to stay afloat even as prices spike, and they don't want to cool the huge growth in interest in their product by pricing it too high. The best breweries will likely turn lemons into lemonade and come up with wonderfully innovative ways around these problems. Every year is an adventure, and I'm looking forward to seeing what 2008 brings. I'll be here--same beer time, same beer channel. See you around the pubs . . . THE HONEST PINT PROJECT-- The five-buck pint will likely be a fact of life in 2008, thanks to global hops and barley shortages. That's OK for most of us, because fresh, flavorful beer is worth that and more. Besides, what are we going to do? Return to the days of Mickey's Big Mouth and Milwaukee's Beast? Not bloody likely. But blogger Jeff Alworth wants us to get our pint's worth when we pay our money, because many pubs, restaurants and bars use a "shaker pint" that's closer to 14 ounces than to an honest 16-ounce pint. The Honest Pint Project on Beervana (beervana.blogspot.com -- one of the places online I regularly visit to stay informed) builds on a foundation laid by erstwhile Portland beer writer William Abernathy, who used to schlep Pyrex measuring cups to bars and broached the subject a decade ago in his Willamette Week column. Alworth has taken it further, though: He now has a list of Portland restaurants and pubs and their glassware on his blog, and he's inviting folks to sign a petition asking for real 16-ounce pints: link. Incidentally, I'll be trying to contact the state next week to see what our next steps are. You have all been fantastically groovy to have signed the petition--I think it will demonstrate a real interest in the issue. Okay, I've discovered a widget that allows me to run polls, so here we go again with a list of the best beers of the year. Call it the people's choice. Two pics. In the first, professor Emerson inspects a glass at the Kennedy School to determine whether it is an Honest pint. (Inconclusive.) The glass contained an oatmeal stout that was adequate, but uninspired. A bit sharp at the finish, not quite as sweet and creamy as I'd like, but in possession of the innate stoutiness that makes me warm on December afternoons. We had just departed Pambiche, a Cuban restaurant where they import not only Xingu beer, but Caribbean sunlight. Another dollop of warmth on a chill winter day. Second pic at Pix, the extraordinary pastry cafe in which you can not only enjoy a Queen of Sheba Truffle Cake, but wash it down with a variety of Belgian ales. You can see from this photo that they do it righ--an engraved tulip glass with a candle to backlight it golden radiance. This, incidentally, is why people score Portland so highly on the "liveability" scale. Find me a town where I can begin with a Cuban lunch, move on to a 92-year-old converted elementary school serving micro-brewed oatmeal stout, and conclude at a French bakery that offers Belgian beers in their appropriate glassware. Can't be done. I hope you are all spending a warm, joyful day with family and friends, perhaps enjoying a winter ale, or perhaps just a slice of roast beast (or even tofu). Wherever the day finds you--here's hoping you're having a delightful Christmas. Well, this lark turned out to be more successful than I would have guessed (particularly given that I launched it just before Christmas). But the very good folks at Witigonen (also here) and BlueOregon have linked to the petition, sending more traffic its way, and there are now a whopping 86 signatures (9:11 pm). 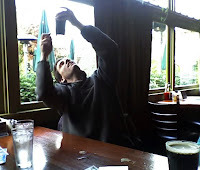 When a patron pays for a pint of beer in a restaurant or pub in Oregon, the glass should hold a full 16 ounces of beer. Unfortunately, the most common type of glassware in regular use is the 14-ounce "shaker" pint glass. In many cases, neither the owners, servers, or patrons are aware that the shaker pint glassware is undersized. Therefore, we, the undersigned, request that the Oregon Department of Agriculture Measurement Standards Division create a program to authenticate glassware used in bars and restaurants as an honest 16-ounce pint. People can include comments with their signatures, and there have been some entertaining ones which I'll pass along for your amusement, as a sort of nightcap to this post. A proper pint is every Oregonian's right! It's surprising to think that, in the state most known for beer culture, you can walk into a restaurant, order a pint, pay for a pint, and legally receive less than a pint. Yay beer indeed--sign the petition! Pint Standards - Sign the Petition! Thank you for your contact with us regarding your question about pint glasses in restaurants and bars. This issue does fall under Measurement Standards regulation, however, we do not currently have an active program for these types of issues and we are therefore unable to investigate it at this time. We have made a record of this complaint and will keep it on file to help provide data to legislation in hopes of gaining a more viable program in the future. Our course is clear. No doubt the reason no such program exists is because the state is unaware of the problem. We must therefore create the political momentum necessary to propel this critically important issue to the front of the Department of Agriculture's to-do line. In service of this noble goal, I have created an online petition for you to sign as an indication of your enthusiasm regarding this pressing cause. You paid your five bucks, you want the comfort of knowing you've received an honest pint! To arms! Last night, Jeff Merkley held a fundraiser with Jon Tester at the Portland Brewing Taphouse. Tester is a member of an exclusive club into which Merkley would like to be admitted--the US Senate. As the blogs reported on the fundraiser today, little mention was made of the beer. It fell to Paul Gronke, a poly sci professor at Lewis and Clark Reed who was in attendance, to raise the issue. Sarah Lane [another blogger] raises this at dailykos, but, sadly, only illustrates her east coast bias and ignorance of those issues most vital to the future of Oregon. For my own part, I regret to inform people that I think I saw Merkley with a Hefeweizen! A Hefeweizen?!? Can it be true? Why not just tip back a Bud Light?? 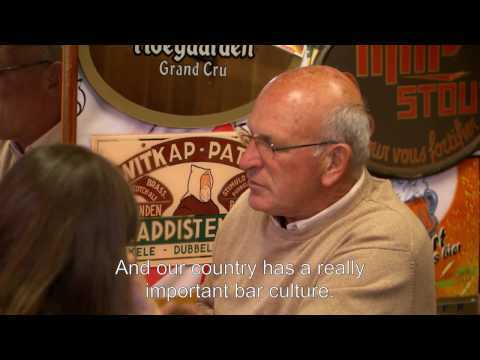 If the man can't handle a dark beer, how can he handle the US Senate? If this can be confirmed, it will indeed be a bad day for candidate Merkley (whom, it should be said for transparency's sake, I support). But perhaps Gronke mistook a cloudy glass of IPA for the offending hefeweizen. Or perhaps it was early on, and he was trying to drink something light so as to stay sharp for his speech. (And also: Pyramid Hef is more in keeping with the German original; while it still "sends the wrong signal" politically, it's a pretty decent beer.) We can't jump to hasty conclusions. Nevertheless, for those who think their beer choice doesn't speak to their character--well, they must never have visited Beervana. Beer matters here. If the cameras are on, candidates shouldn't lightly hoist a Silver Bullet--and of course, they know that. But what if the choice is an organic pale ale versus an Irish stout? Here's a handy guide. Anthropologists and Oregonians, feel free to offer comments. Macro-lager - This suggests the drinker is 83, is from Idaho, or is irredeemably clueless. A sure-fire campaign-killer. Imported lager (Stella, Heineken, etc) - This suggests a drinker attuned to class but not taste, someone who probably finds Oregon ratty and parochial. Culturally, a Heineken drinker falls below a Bud Light drinker and only slightly above a drinker of Night Train. Hefeweizen - (By which we mean Widmer.) Aware of the social impetus to drink local, but lacking a clue. Wishy-washy, undependable, shallow. Pale ale - A pale ale drinker is good-natured and fun, the type of person who looks to have a couple at the pub and talk Blazers. Porter - Porter drinkers are salts of the earth. They are straightforward and honest and hardworking, if not particularly dynamic. Stout - Stout drinkers, like porter drinkers, are down-to-earth, but more avuncular and jolly. They have experienced life and are prepared to share their wisdom. IPA - Tippling an IPA suggests a person of daring character, an innovator, a risk-taker, someone who will take a stand for an unpopular position. A maverick. Amber ale - A gentle soul willing to nurture projects and build bridges. Someone often mistaken for being a patsy, but who has an inner strength. Belgian ale - Suggests an unstable personality, someone who will actively seek out the weird and funky. Dennis Kucinich, for example, is a well-known gueuze drinker. Nondrinker - Not fit for office. The American revolution was fomented in a pub; anyone who refuses a beer is likely a monarchist. And what happens when the president vetos your bill? How will you endure filibusters? When your party gets crushed in an election? If you're not drowning your sorrows in a wholesome beer, I shudder to think what you might be doing. Aside from the first three and the last one, there are really no wrong choices. Of course, if I had been advising Merkley, I would have told him to go for the IPA. Your thoughts? The Pilsner Room is one of Portland's underrated taprooms. Not only does it have John Harris specials on tap year-round, but there are a number of well-selected rotating taps from breweries around the state. I never seem to make it past the Harris rarities, but it's good information to have, just in case you're looking for something out of the ordinary. It has, in addition, a gorgeous view of the Riverplace Marina, an attractive backdrop on any visit. But last night I had a perfect view of the Christmas boats on their departure from the marina and south, down toward Milwaukie. And later, after they had sailed out of view, the Blazers game came on, allowing me to pivot my attention inward as the local boys dished out some pain to Utah for their sixth win in a row. But the salient detail I really need to pass along is the presence of Wreck the Halls on cask. For those of you whose cells are calibrated to a certain level of hop saturation, few beers could be more ideal. It isn't exactly a bitter beer, just one fizzing with hop flavor and aroma. On the surface, you get lots of citrus, but the cask allows other notes to blossom--lavender and pepper chief among them. Especially where hoppy beers are concerned, nothing allows them to breathe so well as cask. In this regard, I think the beer is mis-named. It suggested a bruiser, whereas this beer is pure pleasure. If the brewery wants a seasonal allusion, I suggest "Green Christmas." But whatever, do yourself a favor and stop by for a pint. That time of year. I'll try to get a review of Ontario (Oregon)'s Beer Valley up in the next day or two, and I have some year-end posts to get to as well. But it will probably be a day or two before I have time to sit down. Hours: No regular visiting hours now, but you might catch brewer Rick Allen brewing or bottling if you drop by. It's safer to call ahead. Beers: Pale lager (a pils), schwarzbier, Coastal Common (a hybrid steam beer with Cascade hopping), bock, dunkel, Vienna, seasonals (currently pouring a doppel for winter). Available: Call the brewery to arrange for pickup or delivery. Belmont Station should be carrying them soon. Last night, Oregon's smallest brewery was featured on tap at the Green Dragon. I wasn't able to make it for the official event, but (Dragon-meister) Jim Parker invited me to drop by a couple hours earlier to sample the three beers he was pouring. By chance, I happened to catch owner/brewer Rick Allen, who gave me the history of his brewery and walked me through a tasting. The roads to good beer are many. These days, it's more common for brewers to get an early jump on their career. In a previous age (twenty years ago), brewers came to the trade later in life. Rick Allen is a throw-back. After years as an investment banker, he took a job as a CFO in a California winery for a year. He wanted to come back to Oregon and, with his experience of the industry, considered opening a winery here. But given the odds--hundreds of wineries and only dozens of breweries--as well as his 18 years as a homebrewer, he decided to go for beer instead. The brewery he set up is truly micro--20 gallons a batch. That's 20 gallons, as in .65 barrels. He brews twice a week and the portion that doesn't go in kegs he bottles by hand. That's a mere 320 pints a week, in what amounts to large-scale homebrewing. This is the test phase, though--he wanted to see what kind of market there was for lagers. It has been good enough that he plans to upgrade to a 4-7 barrel brewery by next spring--though even that is tiny by commercial standards. Still, it will be enough that we might actually get to see it on tap in Portland on more than a lightning basis. Every beer brewed by Heater Allen is a lager, just the second such experiment in Oregon's craft-brewing history. You'll recall that the two previous incarnations of Northwest micro lager brewing, Saxer and Thomas Kemper, didn't fare so well. So why lagers? "I like lagers, number one," he said, "and number two, I view it as a market niche. A lot of people do fabulous pale ales--I just didn't think we needed another one." He also likes the way the exceptionally soft water that washes down the Nestucca and Yamhill Rivers gives his beer a softer palate (noticeable indeed--see my review, below). Given the small batches he's brewing, lagers seem like a decent bet. Saxer and Thomas Kemper both tried to support substantial volume--but, even at seven barrels, Heater Allen would be a fraction the size. I suspect people will also be willing to give lagers a second look--in the early 90s, when Saxer got started, lagers still had a strong association with the stuff you got in cans. I think a nice pilsner (see below) will have a receptive audience, and the schwarzbier style is one of the nicest--and tailor made for NW audiences. The three beers Allen brought to Portland were all excellent. He uses a Bohemian pilsner yeast, and it leaves the beers soft and sweet. He spoke at length about malts, which are more evident in a clean lager than in ales--a further reason to welcome these beers. Malts are so often an afterthought in Oregon brewing, where the layered flavors come from complex infusions of hops. In Allen's beers, the malt character is complex, and the hops have to vie for attention (don't worry, they're ample enough for Beervana). Notice also the strength--these beers are true sessions, weighing in at less than 5% abv. Coastal Common - This beer recalls steam beer without actually being one. Steam beers are lagers fermented at warmer ale temperatures, but in Allen's version, only marginally so ("a degree or two"). He designed it to appeal to fans of traditional Oregon ales, and hopped it with lots of Cascade. The result is slightly disorienting. With a citrus bouquet and palate, the tongue settles in for a long, sweet finish. Instead, it dries and ends abruptly. I would need a couple pints to see if I could shake my habitual expectation. (4.9%, 39 IBU) Rating: B. 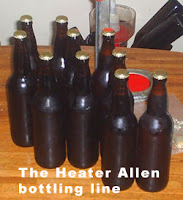 At the moment, you may not have many opportunities to try Heater Allen beers. Even after this tasting, I am left longing for the schwarz and doppel he didn't bring to town. But keep this info in your mind--it looks like Allen has been persuaded to continue this experiment. With luck, we'll see more of his beers on tap in 2008. House Spirits, local makers of Aviation Gin, Medoyeff Vodka and Krogstad Aquavit. Discuss cocktail trends with the editors from Imbibe Magazine. Taste grappa from Ransom Spirits. Sample the newly released Tarragon and Saffron infused vodkas from Sub Rosa Spirits with distiller Mike Sherwood. To make it a fully sensual experience, you'll also be able to sample chocolate from Xocolatl de David. Only adults, 21 and over, are allowed, but it's free. In an email, Mike described his vodkas this way: "Sub Rosa Spirits makes intensely flavored vodkas. One is a tarragon flavored. The other a Saffron flavored vodka, that is more akin to a curry, methinks. Not for the faint of palate." *Mike Sherwood, the man behind Sub Rosa, was formerly the Director of the Oregon Brewers Guild, so there's a link back to beer should you wish one. Via John Foyston, I see that Deschutes has won another busload of awards from a tasting festival--The European Beer Star Awards. Who? The 21st Century may go down as the "awards" century. In a version of Andy Warhol's prophesy, we might say that in the future, everyone is destined to win 15 awards. It's not just limited to beer, of course--literary awards, film and TV, music, food, liquor, wine; they all now have an ever-greater number of awards. (I am a culprit: look for my Beervana beer of the year later this month.) The reason is that awards presenters burnish their own image while createing excitement and interest for their organization. Breweries no doubt like it because everyone loves winning. The ultimate effect, however, is that if everyone is honored, no one is. The net effect of all these awards is that the more we see the results, the less we care. So now we have the European Beer Star Awards, which has apparently been around just four years. Its bona fides seem good--it's hosted by a couple of Munich breweries and the association of small and independent breweries of Europe. Based on the entrants (62% German) and winners (visual inspection confirms that the majority--or at least a plurality--were from "Deutschsland"), EBSA appears to be a mainly Teutonic affair, however. It featured 575 beers from 28 countries--though it's not clear how many breweries that represents. Boston Beer was the big American winner, with eight medals, but Oregon did great, too. We had six winners, including three golds for Deschutes. Rogue and BridgePort also took home some metal. A pdf of the winners list is here. Make of it what you will. Cheers to the winners! After hearing a number of favorable comments about the place, I visited the Green Dragon last week and came away impressed. Not only was the food excellent, but the beer line-up is probably the most interesting in Portland . If this wasn’t enough, it turns out that Jim Parker, the owner and noted beer fanatic, is an old family friend on the Heater side of the equation. So next Tuesday, December 11th, we will be introducing our beer to Portland at the Green Dragon! Beginning at 7:00pm, we will be pouring the Pale Lager, Coastal Common, and Dunkel. Please stop by! You know that beer is good for you. But did you know that an agent in hops is a powerful antioxidant that helps ward off cancer? German researchers are working on a new beer brew that appears to fight cancer. The secret a compound found in hops -- xanthohumol. Xanthohumol shuts down enzymes called cytochromes P-4; they can activate the cancer process. It also helps the body detoxify carcinogens, stopping tumor growth at an early stage. But just drinking more beer won't do the trick. It would take 60 regular beers to equal the amount of xanthohumol researchers are able to brew in this one beer. That's why scientists are now working on ways to give all beers higher levels of Xanthohumol, and even find ways to add it to other foods, like chocolate. And remember, just like chocolate -- the darker the beer, the better it is for you. And there are potentially more beer benefits. Other compounds found in hops are potent phytoestrogens. Scientists say these compounds could ultimately help prevent post-menopausal hot flashes and osteoporosis. Since I don't have any time for blogging today, I leave you with another excerpt from my recently-published novel--allowing myself yet another opportunity to flog it. As blogger Chuck Butcher has noted, "there is an economy of styling and language and the protagonist is well drawn." 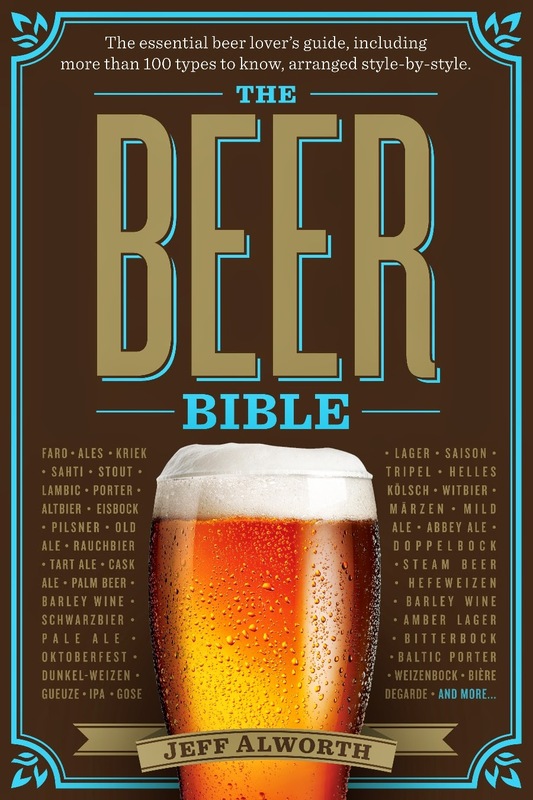 As a good portion of the novel takes place in the presence of beer, I can therefore recommend it wholeheartedly (if not objectively) to everyone. Get your copy today--delivery before Christmas is assured! An excerpt, with the protagonist, Charlie di Paulo, and two friends--Carlos Munro and Clay Lapierre--in a bar scene. “You think that’s really his name--Heater?” Carlos eyed a bank shot on the five ball. “You don’t have the angle.” Charlie’s eyes were peering from the edge of the pool table. “I think he’s got it.” Lapierre, with less interest, leaning against the wall. They looked at Clay for a ruling. “Inconclusive,” he judged. “Maybe our next movie should be about a bookie,” Clay suggested. “Gambling depends on money.” Lapierre noted. “He’s got you there,” Charlie said. The partnership, known as the "Collaborator Project," began in the spring of 1997 when members of the Oregon Brew Crew lamented the fact that there were many outstanding beer styles that were not being brewed by their local breweries. As a result, Kurt and Rob Widmer, members of the Oregon Brew Crew themselves, invited members of the home brewing club to work with the Widmer Brothers Brewing team in identifying and creating the unique beers they felt were missing. 2007 marks the Collaborator Project's 10th anniversary. He also includes a list of the beers produced in the Collaborator project, along with the names of the brewers. You'll see some familiar ones--Noel Blake (writer, brewer, man about town), Ken Johnson (whose Scotch Ale is now made in his microbrewery), Preston Weesner (maestro of the recently-concluded Holiday Ale Fest), Brian Butenschoen (Director, Oregon Brewers Guild), and more. Then-OBC President Bob McCracken and Rob and Kurt Widmer originated this program back in the late 90's. The scholarship was named for Bob after his untimely death at the young age of, I believe, 38, in the last scheduled month of his OBC stewardship. As a result, the proceeds from the project that go to a scholarship fund at OSU are now named in his honor--the Bob McCracken Scholarship Fund. It's been a wonderful experiment, and I hope this is just the first of many decades of good beer to come. Where states abut one another, border towns take on the character of one state or the other, not always with deference to state lines. In Eastern Oregon, there is a cluster of towns just west of Boise on I-84 that look to the Gem State. They share Idaho's cultural orientation toward self-reliance, with gun racks in the back of their pick-up cabs and everything they imply. It is even a little pocket carved out for the Mountain time zone. And of course, it's the kind of place where beer comes in cans--the easier for transporting to the hunting or fishing site. And yet, shocker of shocker, it turns out that Ontario, behemoth of the Eastern-Oregon towns (Vale, Nyssa, Fruitland, ID) at 11,250 people, now has its first brewery. It's called Beer Valley Brewing, and Chris at Belmont Station has a bottle of their amber ale (and hat tip to him for the news). Black Flag Imperial Stout, the first beer released by Beer Valley Brewing, is a monstrously huge beer brewed for beer enthusiasts who want to test the edge of sensory perception. 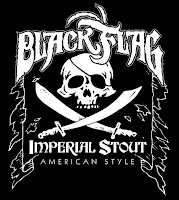 Brewed with 8 different malts and 4 different hop varieties to give it depth and complexity, Black Flag Imperial Stout delivers an extreme beer drinking experience like no other beer on the planet. Whoa--extreme beer from Ontario?! I can't believe it: Beervana now extends to the Idaho border. With luck, that stout will follow the amber over here to the Pacific time zone. Q: What happens when you have a cool little beer fest that features breweries' most creative efforts of the year, is held just off the MAX tracks, and offers a toasty warm respite for shopping-phobes in the middle of the Christmas rush? A: It becomes an overcrowded, big festival in its once-cozy space. Something's gotta give. Pio Square is a wonderful location, looking out as it does on the downtown buildings. But it's only wonderful if you can get a beer in less than 20 minutes (or say, two minutes) and aren't in constant physical contact with all 23 of your closest neighbors. I stopped off after work on Friday for a full pour of Jim (just to be sure) and returned at 11:30 on Saturday. Friday night, even at five straight-up when I arrived, was insane. It was so crowded and so loud that I had to text Sally to find her once she'd gotten (almost instantly) lost in the crowd on her trek to get us tickets; when I tried to call, I couldn't even tell if she picked up. Saturday was all right until about three and then almost instantly the lines went from ten-person affairs to behemoths that ran the length of the tent. The supply and demand ratio is out of whack. Short of raising prices to thin crowds, the thing needs to be moved. How about the North Park Blocks where the Portland International Beer Fest is held? But there was a consolation prize for my attendance--a density of dense beers unlike any I can recall. You couldn't swing a dead cat without hitting a six-month-old, blended, barrel aged, 9% ale--which, admittedly, soothed me quite a bit. The big winners of the fest, in addition to the Jim II and Baltic Porter I mentioned Friday, were Caldera Cauldron Brew, Double Mountain Fa La La La La and Widmer Decorator. Give Widmer extra points, however, for originality. Of the beers I tried Saturday, it was the clear standout. This summer, Widmer attempted an Imperial Wit, a failed experiment that sacrificed all of the virtues of the original style without attracting any of those of imperialization. Consider Decorater a make-up beer. It was apparently brewed with a weisse yeast--anyway, it had a wonderfully tart, zingy profile. Still, despite the hefty alcohol percentage, it was light and refreshing--neither heavy nor the least cloying. I would have guessed a beer of no more than 5% ABV. Amid the heavy monsters at this fest, it was a shocking contrast. I don't know if there's a market for this beer in Oregon (based on the reactions of the people I kept sending over to try it, maybe not), but I would love to be able to buy this on a regular or recurring basis. Rating: A.
Ninkasi Otis (aka "Oatis") - A roasty, rich ale that finished with a sharp, astringent note. Up until that moment, everyone liked it, but the sharpness alarmed some lovers of the soft style. Might have been some tannins from crystal malt or a bit of Chinook or ... ? I liked it, but perhaps subsequent batches will come in a little milder. Hopworks Organic Kentucky Christmas - I would love to know what's in this beer--I got a note that reminded me of sage or rosemary. (Truth is, what it reminded me of was chicken, but much like alder smoked malt reminds you of salmon, I think the note was actually an herb normally used in chicken's preparation.) Unlike a lot of Christian Ettinger's beers, it wasn't a hop bomb but was rather a very nice, warming malty beer. The bourbon was subdued. McMenamins Krakatuk Russian Imperial Stout - Way over-roasty. Like chewing on a handful of roast barley. Pelican Bad Santa - This beer should have been a home run, but the constituent elements didn't come together. The body was very thick and the malting and malt alcohol intense; next to this, the hopping, which was robust, had to merely scream to be heard. The genius of IPAs is that the malt play a decidedly supporting role. Black IPAs are confronted with the difficulty of getting color without a lot of dark-beer notes (chocolate, roastiness, and coffee). Bad Santa didn't pull it off. Barleywines, like stouts, are hard to screw up. You just throw in the kitchen sink and any off notes have no chance of surviving. But because of this, it's also hard to achieve the sublime. Mirror Mirror--at least the taster I had at the Fest--was an indifferent barleywine. It had the strength without the distinction. The notes were muddied without being deliciously stewed. It was strong and hoppy, but tasted like a kitchen-sink beer. An extremely rare beer, so a shame I can't make those of you who didn't have a taster feel jealous. This may actually have been a great beer. I enjoyed it and admired a thickness and depth of flavor I was unable, at that late moment, to describe. "Did you try the Ninkasi?" "Really? I thought it was a little sharp. I just tried the Alaskan Porter. Amazing." "Oh yeah? I'll give it a try." I have worried that craft beer would be regarded as fuddy-duddy by the new generation--most of whom don't even remember a pre-craft era. Consequently, I've keeping an eye on the 20-somethings; so far I hadn't seen anything like the droves who turned out for the fest this weekend. They were there drinking some of the most intense beer brewed, at premium prices, and they were having a ball. It augurs well for the next decade or so. More on the fest tomorrow. Teaser: the best beer at the Holiday Ale Fest wasn't an ale.